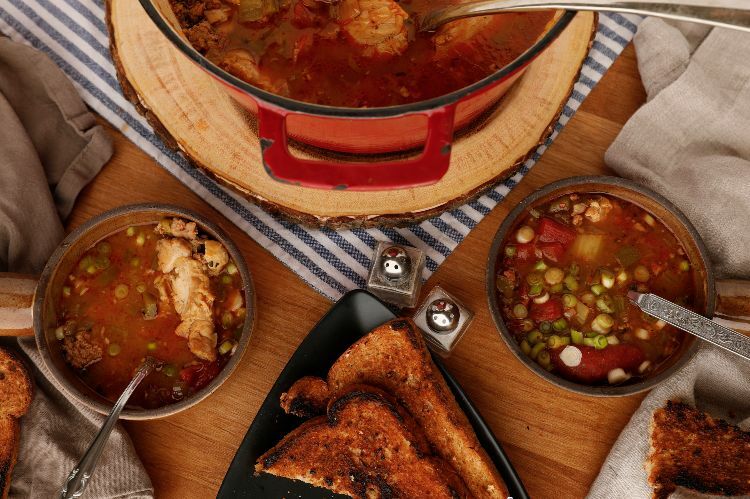 Southern cooks don’t mess around when it comes to stew. The recipe below is a perfect example. It starts with a roux, which is a mixture of fat and flour that is cooked until it turns brown and gives off a nutty aroma. That’s the backbone of the dish’s flavor profile. Meaty chicken and smoky sausage make it thick and satisfying. This stew is similar to a gumbo, except that it doesn’t have gumbo’s defining ingredients -- okra or gumbo file. Still, it’s great ladled over cooked white rice and garnished with scallions, just as you would serve a gumbo. Use any smoked sausage you like, but for real Southern flavor, andouille sausage is ideal. 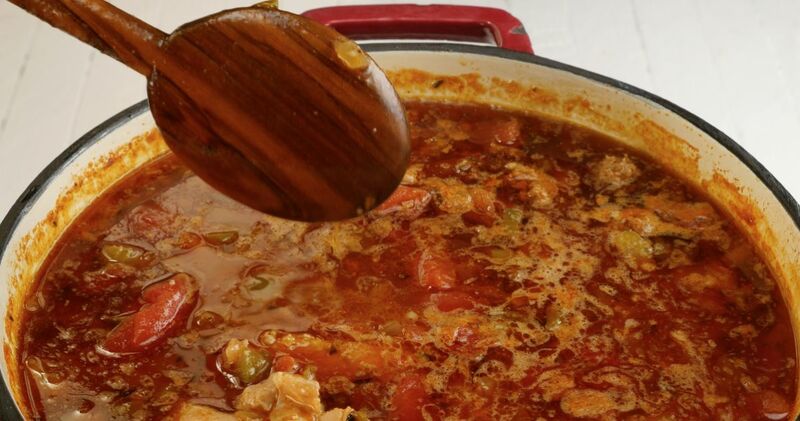 In a stockpot or Dutch oven, heat 2 tablespoons of the oil over medium-high heat. Season the chicken generously with salt and pepper and add it to the pot. Cook for about 5 minutes per side, until golden. Remove from the pan. Add the sausage to the pot and cook, stirring frequently until browned, about 5 minutes. Remove the sausage from the pot. Add the remaining 2 tablespoons of oil and the butter to the pot. When the butter is melted, reduce the heat to medium, sprinkle the flour over and cook, whisking constantly, until the flour turns golden brown and begins to give off a nutty aroma, about 10 minutes. Add the onion, garlic, bell pepper and celery, and cook while stirring frequently, until the vegetables are softened, about 8 minutes. Return the chicken and sausage to the pot along with the tomatoes, smoked paprika, cayenne, thyme, bay leaves and broth. Bring to a boil, reduce the heat to medium-low and let simmer, uncovered, for 45 minutes. Serve hot, garnished with the scallions.